This is not a gay beach, but the gays love coming here. Why? Because this is the "Brazilian" beach, complete with Latino men who prefer square-cut trunks, better to show off their thick legs and plump assets. 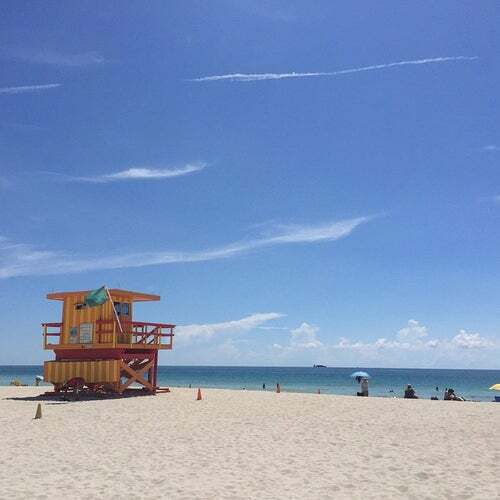 It is also a beautiful area, with soft sand, and it is close to South Pointe Park. This is not a gay beach. It is the "Brazilian beach," popular with the Latino crowd with a feel more like what you'd see in Rio de Janeiro: groups bring stereos, they play volleyball, and (most importantly) the men wear square-cut trunks. And these Latino men fill out their suits very nicely. The eye candy is impressive. Many local gays skip 12th Street and hang out here instead for the best people-watching. It's also a much nicer beach, with more scenic surroundings and softer sand. Beware of the trash, however, this crowd does not clean up its trash every day.